Lei Feng, Chinese propaganda poster by Qiu Wei (丘玮). 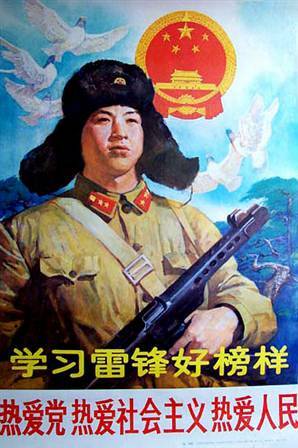 Caption reads: “Follow Lei Feng’s example; love the Party, love Socialism, love the people”. One of the more amusing pastimes to follow in China is watching car drivers attempt to reverse their vehicles. They haven’t a clue. Every car park is equipped with attendants to relieve the drivers of a couple of yuan and to guide them into or out of their parking spaces. Few of the attendants can drive themselves, so it all gets a bit messy. I once stood for a full 15 minutes watching some mumpty tried to park his rather small car in a space where I could have parked a bus (yes, I have driven buses). Several Chinese friends have been astonished to learn that in the UK and most other countries, there are no reversing guides and that you can’t pass a driving test until you learn to do it by yourself. But guiding reversing drivers is a dangerous job. China’s most famous do-gooder, the probably fictional Lei Feng was killed in 1962 at the age of 22 while guiding a reversing truck. The truck hit a telegraph pole which fell, killing the saintly Lei. For those who don’t know, Lei Feng was a young soldier in the Peoples’ Liberation Army (PLA) who devoted all his free time to doing good deeds and being a good Maoist. He is still regularly trotted out by the party propagandists and every school kid is taught to follow his example. I’m not sure if that includes being a figment of the imagination and reversing trucks into fatal telegraph poles. Recently, a Liuzhou man has been described as a new Lei Feng (it happens regularly). 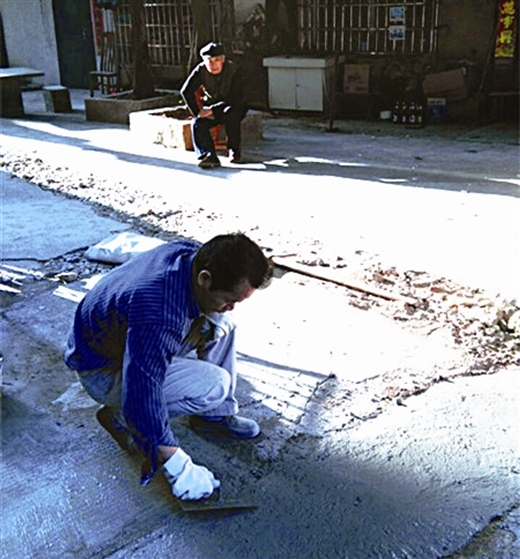 朱常明 has been praised for taking it upon himself to buy the necessary cement and other materials and fill in potholes left in his locality by construction vehicles. He was concerned, we are told, that residents were kept awake by the noise of cars bumping along the road; that a number of elderly residents found walking dangerous; and that one woman had been seriously injured when her e-bike hit a hole. It is also reported that about a year ago, he was responsible for saving the life of a man who had collapsed in a toilet after suffering from a stroke. Let’s hope he doesn’t take up guiding reversing telegraph poles or the like. One thing the news doesn’t mention is why the holes have been left unattended by the local road authorities or whether the construction companies are liable for the costs of repairs. Why ask questions when you can churn out the usual empty propaganda?
. This entry was posted on Monday, December 5th, 2016 at 12:33 pm	and is filed under Falling Down Holes, Health, Liuzhou News, Propaganda, Traffic Traumas. You can follow any responses to this entry through the RSS 2.0 feed. Both comments and pings are currently closed.